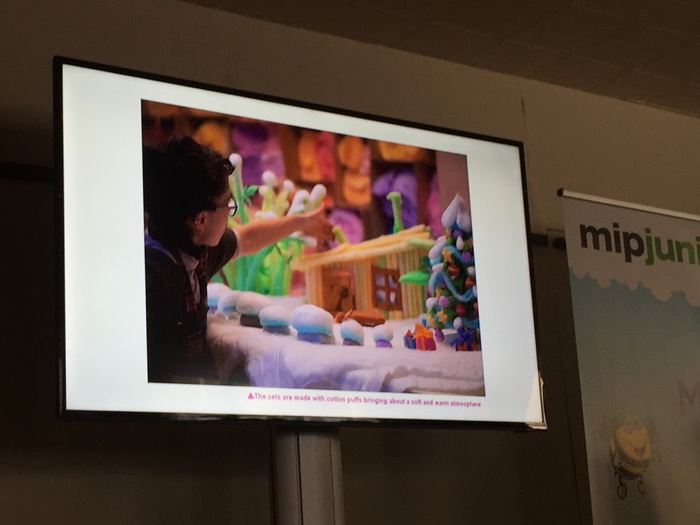 Today at MIPJunior, Catherine Balsam-Schwaber, Chief Content Officer at Mattel since September 2015, discussed what trends and innovations are transforming the kids industry. Her keynote was followed by a short Q&A, moderated by Kristin Brzoznowski, executive editor at WorldScreen. Their interests and new behaviours have driven us — and Mattel — into the age of connected platforms for telling stories. One-third of children under 12 make their own video content, and kids between eight and 18 spend half their waking hours with a screen — a personal portal to friendships, stories and brands. Unsurprisingly, YouTube is their primary search engine. As a result, toys and content are both growing together, and are valued together. “Parents are embracing digital content as a more valuable tool in the playspace of children,” said Balsam-Schwaber. To illustrate this point, below is an episode of “Dreamtopia,” a web series that revolves around Barbie’s younger sister, Chelsea, and whose adventures are powered by her imagination. This afternoon we also learned the nuances of producing children’s programming for Japan. 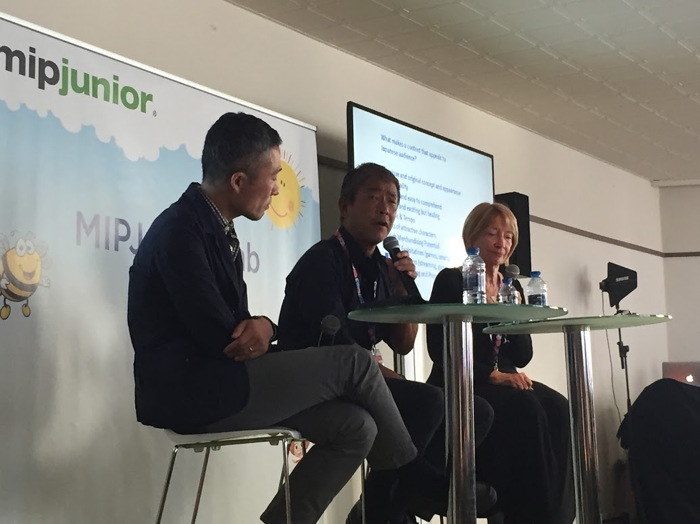 The session included senior producer Keisuke Tsuchihashi of NHK, SVP Fumitaka Torio of Sony Creative Products, and moderator Marlene Edmunds, CEO of Marlene Edmunds Media Consulting. One of Sony’s recent creative successes, Mofy, is “the first cotton animation in the world.” Mofy is a fluffy white rabbit who lives in a cotton plant, so—working with Misseri Studio in Italy—the producers created an animation made entirely by hand and out of cotton. Mofy is currently in season 3 production. Tsuchihashi saw the pilot in 2010, and was impressed: While NHK typically invests more in co-production, Mofy became an acquisition. “For producers, it is important to understand why we chose Mofy. The character is very cute; it appeals to mothers,” he said. Remember that competition is tough for newcomers. “Our timeslots are occupied with popular titles like Curious George, Spongebob, Thomas and Friends, and, of course, Mofy. All these writings are very good, so we cannot change those titles to new ones easily,” he said. 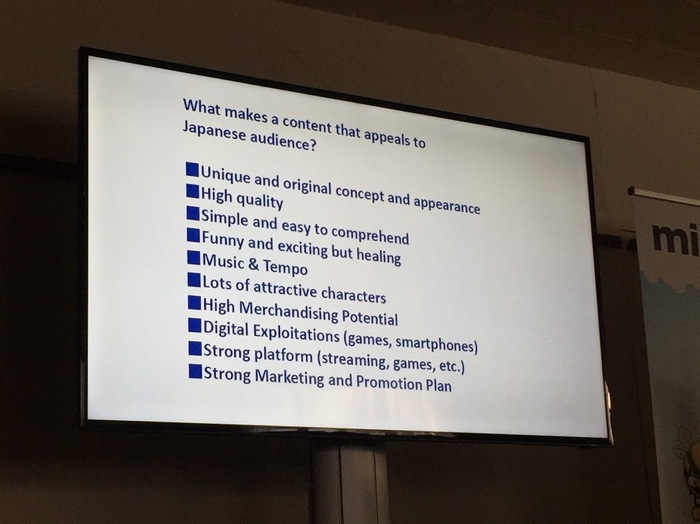 The Japanese character content market—which can range from Mofy to the very familiar Hello Kitty—is unique, and may transform the way you market your IP. “What surprises Westerners is that the main targets are actually not children, or moms; it’s adult women in their 20s, 30s and 40s,” Torio revealed. A panel session earlier in the afternoon (photo below) explored two companies who are ‘disrupting family programming’ with factual content for kids: Kidspiration.tv and Sixth Sense Media. The latter is the producer behind non-scripted observational documentary shows like Time for School and Our Family, which both air on CBeebies in the UK. Sixth Sense Media anaging director Sallyann Keizer said the company is passionate about helping children become socially aware and responsible, adding that the distribution channels for this kind of content are evolving, as children flock to YouTube. That will include features for children to create their own archives of their family experiences, for example, because YouTube is encouraging the current generation of children to think of themselves as creators, not just viewers. Keizer admitted that she has some concerns about children putting themselves on platforms like YouTube. “How do we make that work within a safe, exciting and entertaining environment where we are still supporting our younger generation?” she said, noting that a broadcaster like the BBC spends a lot of time debating how to protect the children in its shows – protection that, by implication, may be missing on online-video platforms and social networks where the kids are publishing the content. Laura Galloway, executive producer / programming and marketing for Kidspiration.tv, explained how her company is trying to fill a “gigantic hole in the content market for kids between 8 and 12 years old”. How? By producing shortform shows where children interview “some of the best thinkers of our time” from tech execs and journalists to film directors and cancer surgeons. “There’s a lot of good programming out in the world, but there was nobody doing this… letting kids dictate the questions and the conversation,” said Galloway. The project launched with 10 interviews, and 40 more have been filmed, with an average length of around six minutes per interview. The series was launched online, on YouTube. “We felt that this kind of information needed to be democratic, and it needed to be accessible to all kids,” she said. “We put this online so it would be accessible to everyone.” But Kidspiration is open to the idea of expanding onto more traditional platforms. Kidspiration is marketing its content on YouTube and Snapchat – the platforms where older children are spending their time – but Galloway said that appealing to parents and educators will be important to reach younger kids. At day’s end, we were treated to a MIPJunior world premiere TV screening for Grizzy and the Lemmings, created by Studio Hari. It takes place around a forest ranger’s house, a small human haven in the wilderness. Grizzy, a bear who believes he’s the most evolved animal on earth, attempts to seize the ranger’s territory as soon as he’s away. The only animal that dares contest his sense of privilege are the lemmings … the most “ridiculous” mammals in existence! Creators and Studio Hari founders Josselin Charier and Antoine Rodelet hit the stage to explain how Grizzy and the Lemmings came to life. Driven by the desire to become a slapstick duo, they were inspired by Walt Disney Documentary White Wilderness, which features lemmings jumping off a cliff. But the seed was planted. They paired the notion of numerous, speedy and silly lemmings with a singular, slow and equally silly bear. “What could they fight for in a natural reserve of Canada? It had to be interesting for both sides: The ranger’s house,” Rodelet narrates. “We had a concept. We were so happy and confident about writing it,” Charier continues. “After a few weeks we were exhausted … the process seemed almost limitless.” Because the comedy was so physical, they brought storyboarders aboard. And, since the storytelling is more than visual gags, they also brought in scriptwriters and director Victor Moulin. All those people were gathered in the same room and asked to write together. Today there are 78 complete episodes, each about seven minutes long.